Hi Jody. I gave this one a try because of the award too, but I didn’t get past the annoyed/pissed off stage you described in #3. 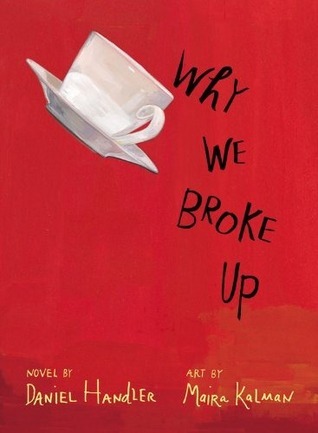 I did like how each chapter ended with “and that’s why we broke up” though. And I was intrigued enough to set it aside as a “to try again later” book. Thanks for sharing! Yeah. That was something, right? I’m going to read the other honorees and the winner, over the remaining year. I’ve heard that the winner, Where Things Come Back, breaks all kinds of rules, too! Gah. We’ll see. Yep, I read that one, and probably wouldn’t have picked it up or kept going if it hadn’t won two major awards. But curiosity won out and I ended up being quite impressed – I reviewed it on Goodreads. I’m not getting my feed right now! Sorry I missed your review! Glad to know that the book impressed you, though!